If you’re interested in picking up classical guitar, there are three essential lessons to learn that will only help you to succeed, and they’re lessons that nearly every classical guitarist has mastered. Being able to play without a pick is essential for playing in the classical guitar style (you could however use a thumb pick). You’ll need to keep your other fingers free to pluck other strings, since sometimes you’ll even have to play two strings at once that aren’t next to each other. So, if so far you’ve only been playing with a pick, it’s time to learn how to use your fingers. Generally, your thumb is responsible for the lower three strings, while your index finger, middle finger, and ring finger are responsible for the G, B and high E strings, respectively. There are many resources online to find charts and exercises to practice, but this is definitely a skill you will want to have. When you form a chord with your fretting hand and then play each note in it individually instead of strumming it, you’re playing an arpeggio. 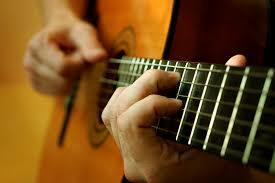 Being able to play arpeggios is essential in classical guitar, and you’ll find them in many pieces. They are sometimes referred to as “broken chords,” because all the notes you play belong to the same chord, though you’re not playing them at the same time. In classical guitar, you’ll find an arpeggio to be an important element that brings beauty and sophistication to music. Finally, it’s extremely rare to find a classical guitarist that is unable to read music, because the majority of classical music you’ll be playing will be written down! You can always find a recording online and play by ear, but to truly be able to master classical guitar, you’re going to want to know how to read actual music, and not just tablature. A trained musician can take a piece of sheet music and, having never heard the song, be able to reproduce it exactly as it should be played, because the sheet music contains not only the correct notes to play, but the values, techniques, speed and intensity at which to play them. Tabs usually don’t offer that! By taking the time to learn how to play arpeggios, read music, and properly play with your fingers, you’ll be well on your way to moving on to more advanced classical guitar pieces.